It was a different era, when all men felt it their patriotic duty to serve in the US armed forces, risking their lives, for their country. The men, who fought the Korean War, June 25th 1950, were fighting to secure the peace and security, which we know today. But, what of the character of a man … a US Army Corporal, who saves the lives of his men, returning to the battlefield, under enemy fire, until they are secure? George Edward McClintock was such a man. Awarded the Purple Heart, he was always humble about saving the lives of fellow soldiers. Instead, he chose to remember the lives of the men he could not save. At the age of 88, George joined them, passing away peacefully, on February 9, 2017, in Santa Barbara. George was born in Chicago, Illinois, on January 16th 1929, to Edwina and George McClintock, Irish immigrants, from County Cork. The family moved to Los Angeles, when he was very young. George had three other siblings, Norma Jean, Dennis and Patricia, now all deceased. He was tall for his age and, at 6’ 4”, loved to play high school basketball, which led to George’s recruitment, by Santa Clara University. He served in the military and fought in the Korean War, before being honorably discharged and awarded the Purple Heart, in 1952. 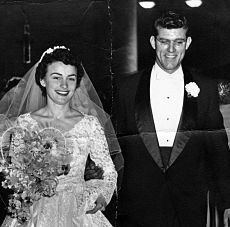 But, the happiest day of his life was, February 20th 1954, when George married the love of his life, Inez Lucy Fantin, the daughter of Italian immigrants. The young couple moved to Santa Barbara, purchasing a home on the Mesa, where they intended to start a family. They welcomed six children into the world, five daughters and one son, all of who became their pride and joy. Of his many interests, George had a passion for Jazz, founding Santa Barbara’s first jazz club, the Spigot, on upper De La Vina Street. The Spigot was an incredible night spot and through its doors came the jazz greats: Louis Armstrong; Cal Tjader; Dizzy Gillespie; Herbi Mann; Marv Jenkins; Cannonball; Curtis Amy; and the Ray Charles Band. His wife, Lucy, prepared homemade Italian pasta, serving it, “compliments of the house,” to their patrons. After concerts, George invited musicians to his home, for impromptu jazz sets, while enjoying barbecue steak and more of Lucy’s “old world” Italian cuisine. Theirs was a community of friends and family, loving and supportive, especially through Lucy’s long struggle with MS, which took her life, on January 21st 1989. George’s later years were focused on the achievements of his children and grandchildren, a proud legacy and a lifetime devotion to his family. An Irishman to the heart, he had a great sense of humor and amused everyone with his stories of “the kids.” George loved SB County’s natural beauty… looking out to sea, enjoying incomparable sunsets, along Goleta Beach and long walks, on hiking trails. He undertook one such hike, on the Nawoi Falls trail, near Lompoc, at the youthful age of 84. Everywhere he went, his constant companion, was his service dog, Bruiser, a 20 lb. Pomeranian, resembling a fox. Some of his last words were to the effect, “Make sure to give him love.” For the infinite, loving example he brought to life, strength in family, and enduring joy, we loved George well. George is survived by his six children: Kathleen McClintock Stimson DDS, Diana McClintock, Darlene Reynolds, Cynthia Hagon, Mark McClintock and Norma Howell and ten grandchildren: Jaclyn Hagon, Briana Curry, Chad McClintock, Nathan Hagon, Jacob Reynolds, Maria McClintock, Joseph McClintock, Kelsey Stimson, Jessica Howell and Kathleen Stimson. The Rosary is at Saint Raphael’s Church at 6:30 PM on Thursday February 23rd, 2017. The funeral is Friday February 24th, 2017 at 10:00 AM at Saint Raphael’s Church with a reception to follow, location to be announced at the funeral.